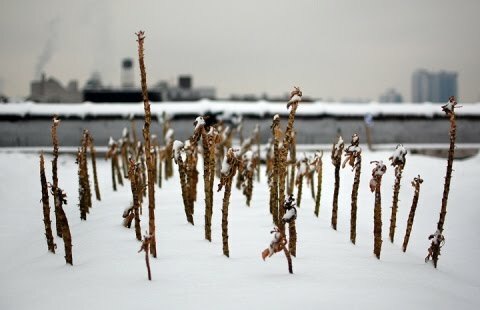 Last month I took in a terrific exhibition of photography by my old friend Scott Nyerges, documenting a year in the life of the Eagle Street Rooftop Farm in Greenpoint, Brooklyn. The farm (all 6,000 square feet of it) sits atop an old warehouse near the mouth of Newtown Creek as it spills into the East River. Typical farming may not lend itself to photographic opportunity, but add a view from a few stories up, and you get something rather surreal. 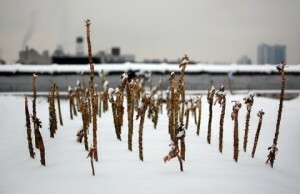 The rooftop farm, one of several sprouting up on top of New York buildings, offers local restaurants and budding farmers an opportunity to use organically grown produce and even grow their own food. But the Eagle Street farm actually brings Greenpoint back to its roots. Literally. And nods to the origin of its name. 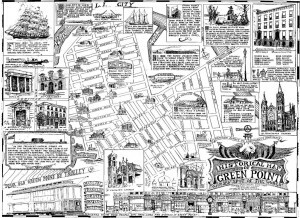 I’ve always associated Greenpoint with industry, its shores dominated by dockyards and its rows of streets, running in alphabetical order from north to south, defined by factories and warehouses. Its rich Polish community traces its development to immigrants who moved here to work in those very places. But the original settlers to the area had a very good reason to call it Greenpoint. This was once a vigorous and fertile farming community, with ideal soil conditions and access to a waterway that could get farmers to the thriving markets of New York. There was even an actual point of green, so to speak, a slender neck of land covered in grass that jutted into the East River at this location. (One source says the point was actually planted with green wheat.) 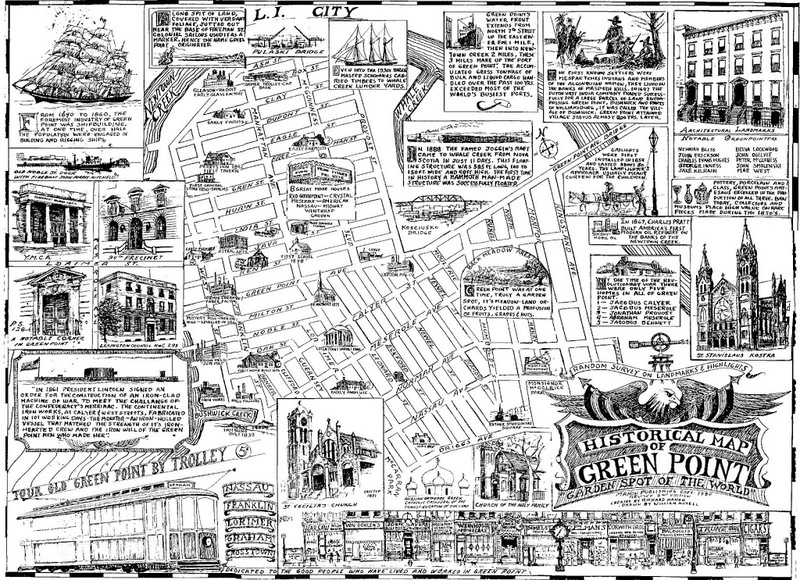 Those travelling along the river in the early days called it as they saw it — Green Point. I’m not sure what happened to this long-gone natural feature, but eventually it lent its name to the entire neighborhood. Also gone is a third body of water, filled in long ago, that helped define (and segregate) the region — Bushwick Creek (sometimes known as Norman Kill), which ran south, and separated it from the town of Williamsburgh to the south. For some idea of where this creek might have sat, simply erase everything between the Bushwick inlet and McCarren Park and replace it with a marsh. The region became part of the Dutch town of Boswijck (Bushwick) in 1638 and would not become distinguished by its current name for almost 200 years. During the time, the area was noted for large farms, many in the early days worked by slave labor. One of the first farmers was the Nordic implant Dirck Volckertsen whose nickname, Dirck de Noorman, gave the creek its alternate name. By the age of the Revolutionary War, farmers with familiar names like Meserole, Calyer and Provoost all set up stakes here. During these years, Greenpoint earned its nickname as the ‘garden spot’ of the region; but with the growth of New York, Brooklyn and Williamsburg in the early 19th century came the industrialization of the shores. The old farms were replaced with factories. Its name became a bit of a farce as oil refineries and shipyards soon defined the area. Bushwick Creek was filled in by the early 20th century. The Eagle Street Rooftop Farm brings urban agriculture back to the neighborhood after almost 150 years. Too bad it’s the dead of winter here in New York and currently snowing, because a lovely stroll through some tended fields, high in the skyline, sounds like a really good idea right now. You can see more of Scott’s rooftop photography at his website. The Eagle Street Rooftop Farm reopens in April.